Public Speaking Is Scary For Most Of Us! Public speaking has always been scary for me. Whether it was a report in a classroom or talking in a big meeting, that fear continues to creep up on me. This is why I was happy to find “Public Speaking Super Powers“, by Carma Spence. Obviously, this is a book about overcoming or at least dealing with the fear of speaking in a public forum. 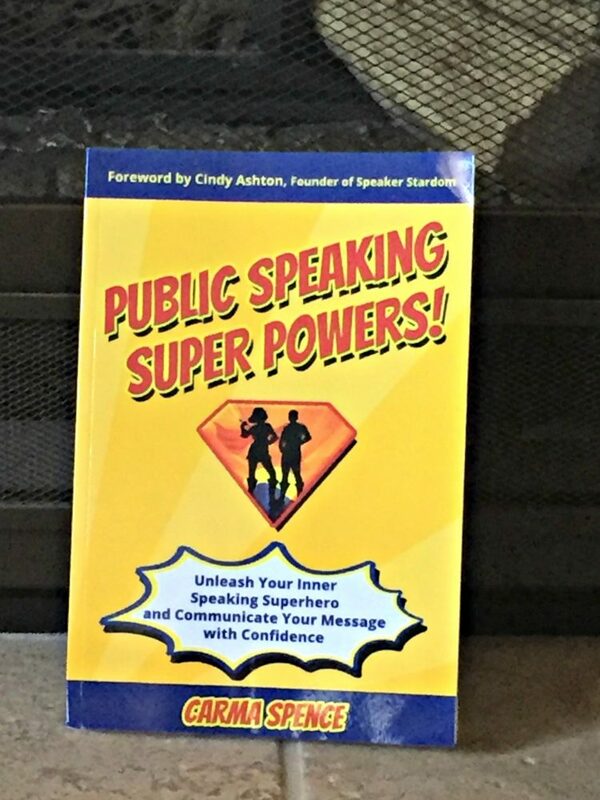 The book is funny and the author even compares superheroes to public speaking. I really like the way this book is written. A sense of humor is always great at breaking the ice, especially when there’s fear! The book not only speaks about the fear of public speaking, but it also explains how to actually talk about something that others want to hear. What good is speaking well if you don’t have anything interesting to say? They’ll leave the meeting saying “wow, she is great at speaking about the most boring stuff!”. That’s not something I want anyone saying about me, and I’m sure you don’t either. The author talks about “unleashing your speaking superhero” and of course, communicating with confidence. Think about the last time you listened to someone. If you hear a person talking but they have absolutely no confidence in what they’re saying, you’re not too excited to listen, am I right? Now add in an abundance of confidence! We tend to give our attention to anyone as long as they’re sure of what they’re delivering. As a matter of fact, we would probably listen to something ridiculous, as long as they act like it’s important and they show confidence. For example, have you ever walked by a person that is looking up at the sky? What’s the first thing you do? We look up to see what they are so sure they see. They’re confidently displaying an interest at an object in the sky. It’s a little crazy, but it works. So, how do you overcome your public speaking anxiety? Well, the first step, according to Carma Spence, is to practice in front of the mirror. Then, you can move to try speaking in front of a camera (that is turned off). Next, turn that camera on! The next scary step is watching that video and then showing someone you trust. This book is a great reference to keep and go back to! Maybe highlight and make some notations too. I am impressed by the writing and the ease of understanding. It’s available on Amazon or you can simply click on the links I’ve provided. Thank you for your wonderful commentary on my book. I’m glad you enjoyed it! No problem Carma! I absolutely loved the book, thank YOU!